One need not refer to well-known bestseller lists to appreciate that more Americans are familiar with Allan Eckert’s telling of frontier history than with the writings of any dead or living, academic historian. Every generation has its own popular historians, the one’s whose writings feed a society’s desire to know their origins. And, if Eckert’s popularity is any indication, those writers who play loose and fast with historical detail and do so in the name of drama and narrative appear to be the most popular and influential. 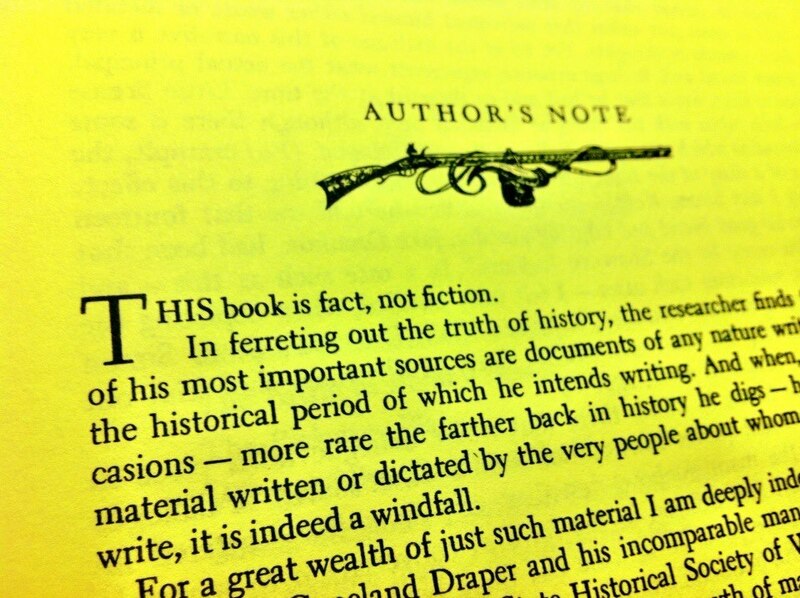 They are the writers of myth and legend as much as they are writers of history. Eckert’s tale of the conquest of the Scioto & Ohio Valleys speaks to the psyche of many Americans who came of age in the Cold War. During the 1960s and 1970s, thanks largely to Eckert's influence, a popular myth arose that the great Shawnee leader had once fought and killed Americans near the Mouth of the Scioto. 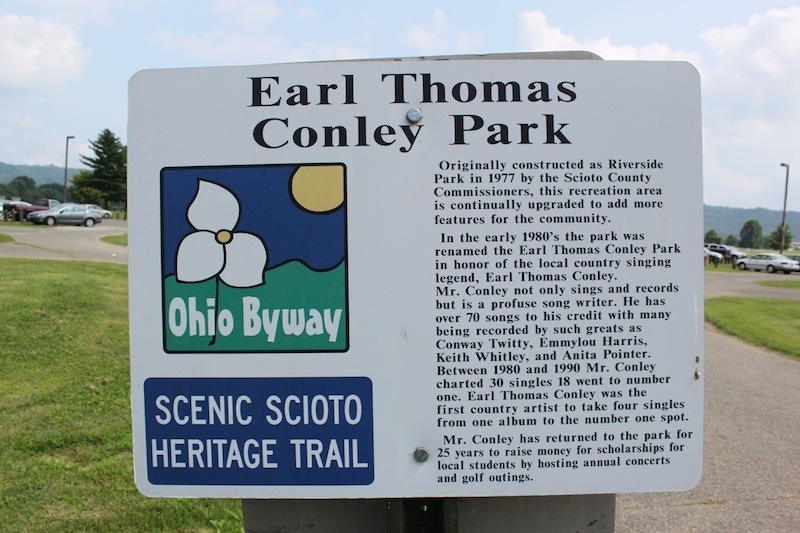 In October 2001, the Scioto County Commissioners dedicated the Allan W. Eckert Trail, which winds its way along the Ohio River through the Earl Thomas Conley Riverside Park. The trail offers the visitor with a view of the banks and bottom lands at the confluence of the Scioto and the Ohio. When the Moundbuilders and their Shawnee descendants after them built their villages and farmed these rich alluvial soils, the Mouth of the Scioto was not located where it is today. There is an Old and New Mouth to the Scioto. The Eckert Trail is located just down the Ohio River from the Old Mouth, which had been the location of Lower Shawnee Town in the 1740s and early 1750s. By the 1780s, when Tecumseh is said to have fought here, Lower Shawnee Town had long been abandoned, with a new growth of trees shading the lands where the village once stood. In the 1830s, the Scioto River was given a new mouth. In an effort to facilitate trade at the southern terminus of the Ohio & Erie Canal, the strip of land, known as the Isthmus, was cut near the steep East Side bank of the Scioto at Portsmouth; the waters of the Scioto were thus diverted directly into the Ohio, creating the New Mouth. By this point, the American settlement of Alexandria, which had been located on the West Side of the Old Mouth (upon the very same grounds of the even older Lower Shawnee Town) was long abandoned and its streets turned into fields of corn. As Alexandria faded and the pioneer generation passed to their graves, the legends surrounding Tecumseh and the Mouth of the Scioto would only grow. Back from the river, above the West Side of the Old Mouth, is Raven Rock and beneath it is where Eckert located the opening scene of his most successful work -- the outdoor drama "Tecumseh!" As legend has it, Raven Rock was one of the strategic overlooks, which enabled Indian warriors to see the approach of American boats (both up and down river). From these heights and distances, they had the time to set their river bank ambushes, with devastating consequences. 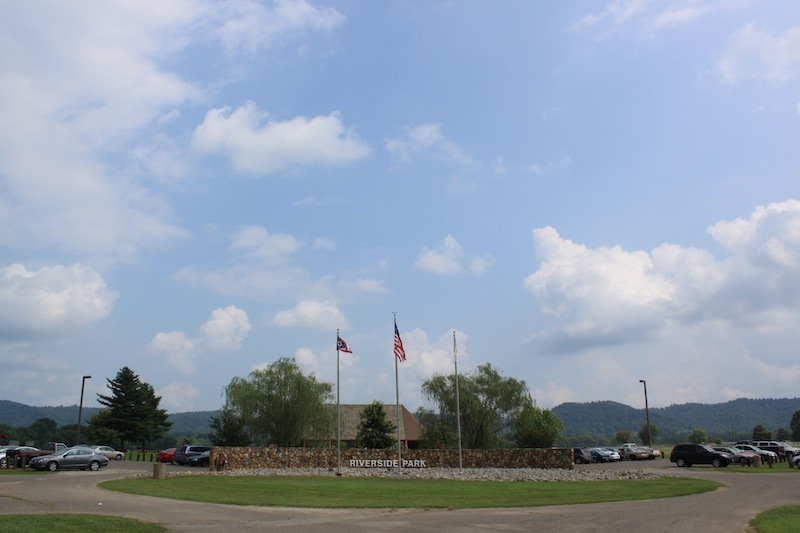 Here, according to Eckert's telling, Tecumseh first proved himself in battle, helping kill and capture American settlers, only later to proclaim his opposition to the torture and execution of one of the American prisoners. 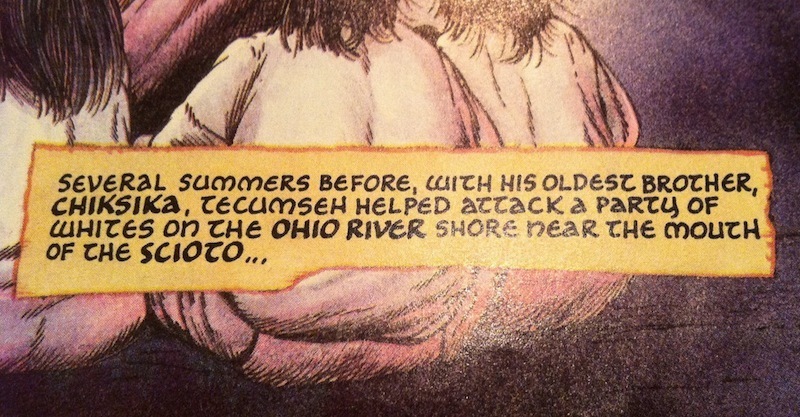 For Eckert the story of Tecumseh near the Mouth of the Scioto is a hero’s coming of age tale; it defines Tecumseh's character and establishes the narrative’s moral compass. Tecumseh is, at this point in his life, still a young warrior, one who lives in the shadows of his older brother, Cheeseekau. As the fates would have it, Simon Kenton and a small band of Americans are out scouting land and hunting near the Old Mouth of the Scioto when they are attacked by Shawnee warriors. The Indians run off the Americans, though one is taken prisoner and is being beaten, tortured, and is set to be killed when Tecumseh intervenes and chastises the other warriors for their “dishonorable” treatment of the American. Tecumseh wins over his brother Cheeseekau and with some resistance, the other warriors embrace Tecumseh position -- they will no longer torture and kill prisoners in their fight to stop the encroachment of Americans onto their land. Simon Kenton, Eckert’s eponymous “frontiersman,” comes to respect Tecumseh because of this, and, at the end of the drama, when Americans kill Tecumseh during the Battle of the Thames, it is Kenton who purposely misidentifies Tecumseh’s body to protect it from mutilation, the ultimate dishonor inflicted upon the Indian dead, at hands of savage American warriors. In Eckert’s telling, the nobility of men like Tecumseh and Kenton were no match for the more common land-hungry, racist, and violent American settlers and their well-armed, though frequently poorly trained soldiers. It was men like future U.S. president William Henry Harrison and future Ohio governor Thomas Worthington, who wrestled these lands and waters from the hands of Native Americans, and the tragedy of it all, of course, is that the characteristics so celebrated by Eckert, the very aspects of the drama that ensures the story of Tecumseh remains popular in the region, were not enough to ensure an indigenous victory in their efforts to block the western expansion of the United States. In recent years, John Sugden's research into the life of Tecumseh has challenged Eckert's and earlier accounts of this eventful moment. Sugden returned to the original source of the story, an account of Tecumseh life by Stephen Ruddell, an American who had been taken prisoner and adopted by Tecumseh's family when he was a young boy. In Ruddell's telling of the tale, no date or specific location was given, except that Tecumseh was 15 years old at the time and it involved flat boats on the Ohio. It turns out that Benjamin Drake, Tecumseh's first biographer, had erroneously claimed, without any additional evidence, that the attack occurred above Maysville on the northern shores of the Ohio. Relying on newspaper accounts from the time and Tecumseh's approximate age, Sugden made the case that the attack occurred further down the Ohio, near the Mouth of the Great Miami in March of 1788. Did Tecumseh ever visit Raven Rock? While we will never know for sure, in all probability he did, there is just no historical record to establish the fact. Visitors to the Riverside Park should consider combining a walk along the Allan W. Eckert Trail with a hike up to the top of Raven Rock. Imagine the Ohio River bottoms here covered in Old Growth forest, with a large maple grove near the foot of Raven Rock. Picture a Shawnee village and an American frontier settlement being washed away by flood waters. Please note, however, that a free permit from the Ohio Division of Natural Resources is needed to visit the Raven Rock Nature Preserve. Allan Eckert, The Frontiersmen: A Narrative (Ashland, Kentucky: The Jesse Stewart Foundation, 2007). Allan W. Eckert, Tecumseh! A Play (New York: Little Brown & Company, 1974), 4. Benjamin Drake, Life of Tecumseh and his Brother the Prophet with a historical sketch of the Shawanoe Indians (Cincinnati: H. M. Rulison, Queen City Publishing House, 1856), 68-69. John Sugden, Tecumseh: A Life (New York: Henry Holt & Company, 1998), 48-52. 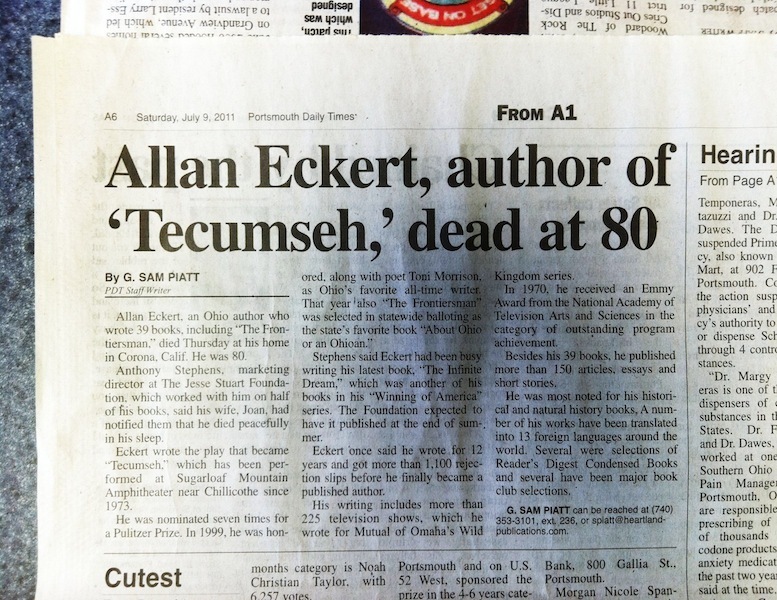 Allan Eckert Obituary, Portsmouth Daily Times (9 July 2011). 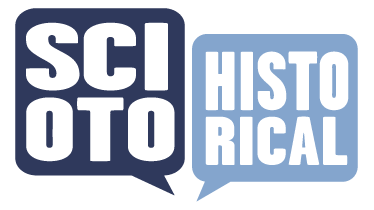 : Image courtesy of the Scioto Historical Collection, Digital History Lab, Clark Memorial Library, Shawnee State University, Portsmouth, Ohio. Earl Thomas Conley Park marker, Scenic Scioto Heritage Trail, Scioto County, Ohio (2012). : Image courtesy of Andrew Lee Feight, Ph.D., from the Scioto Historical Series, private collection, Friendship, Ohio. Earl Thomas Conley Riverside Park, Scioto County, Ohio (2012). : Image courtesy of Andrew Lee Feight, Ph.D., from the Scioto Historical Series, private collection, Friendship, Ohio. 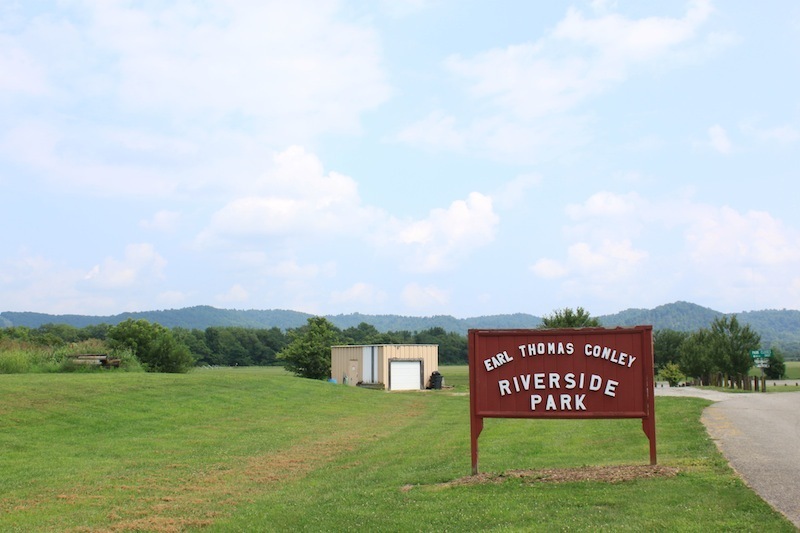 Entrance Sign, Earl Thomas Conley Riverside Park, Scioto County, Ohio (2012). : Image courtesy of Andrew Lee Feight, Ph.D., from the Scioto Historical Series, private collection, Friendship, Ohio. 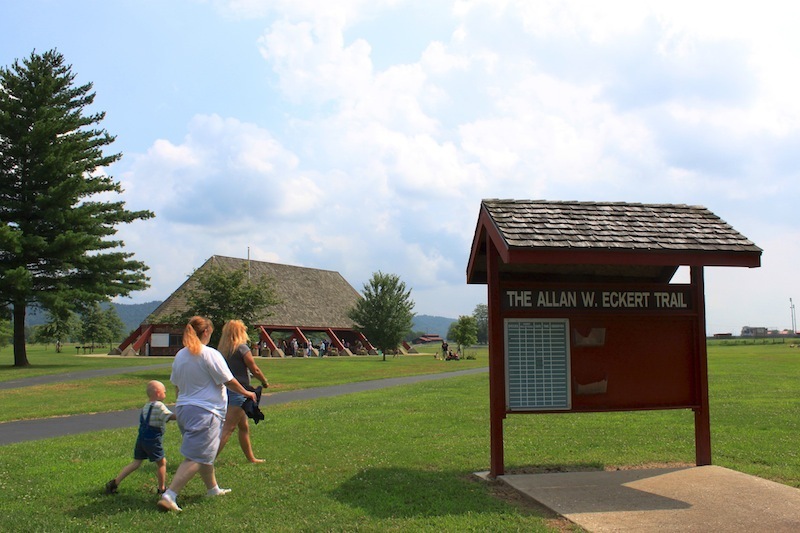 The Allan Eckert Trail, Earl Thomas Conley Riverside Park, Scioto County, Ohio (2012). : Image courtesy of Andrew Lee Feight, Ph.D., from the Scioto Historical Series, private collection, Friendship, Ohio. Simon Kenton Remembers, "So you're Tecumseh! 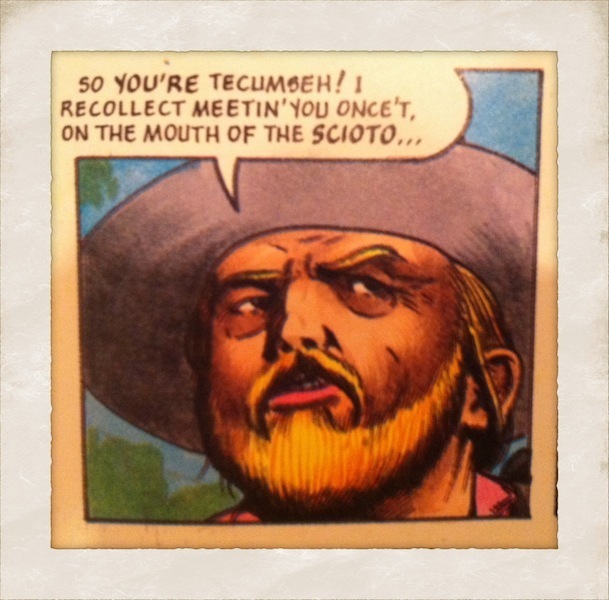 I recollect meetin' you once't, on the Mouth of the Scioto..." by Timothy Truman (1992). : Image Credit: Timothy Truman, "An Illustrated Adaptation of Allan W. Eckert's Tecumseh!," Eclipse Books (Forestville, California, 1992). 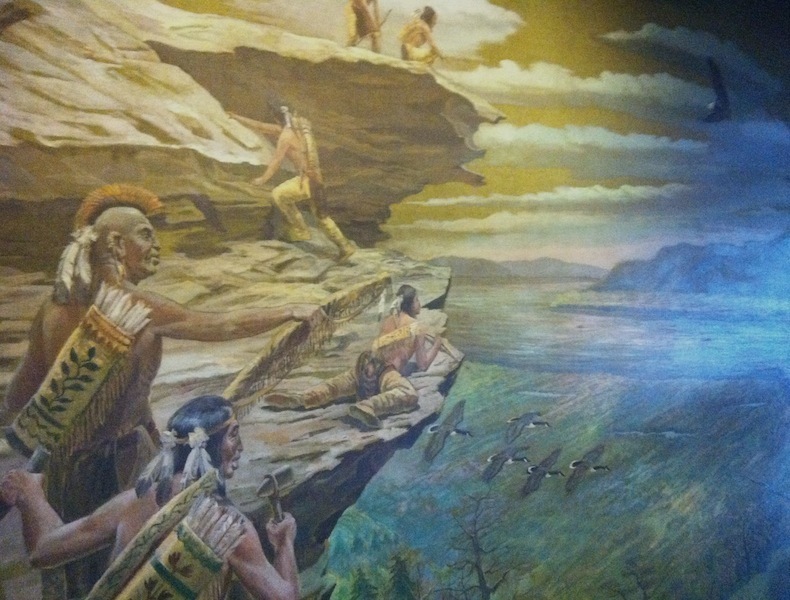 "Several summers before, with his oldest brother, Chiksika, Tecumseh helped attack a party of whites on the Ohio River shore near the Mouth of the Scioto …" by Timothy Truman (1992). : Image Credit: Timothy Truman, "An Illustrated Adaptation of Allan W. Eckert's Tecumseh!," Eclipse Books (Forestville, California, 1992). 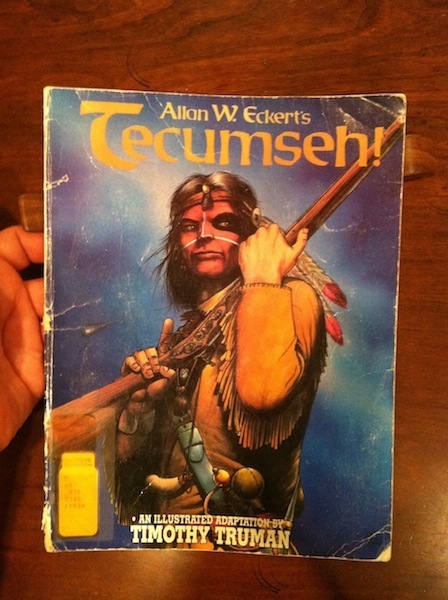 Timothy Truman's "Illustrated Adaptation" of Allan W. Eckert's Tecumseh! : Image courtesy of Andrew Lee Feight, Ph.D., from the Scioto Historical Series, private collection, Friendship, Ohio. "Author's Note" to "The Frontiersmen," dated Dayton, November, 1966.: Image courtesy of Andrew Lee Feight, Ph.D., from the Scioto Historical Series, private collection, Friendship, Ohio. 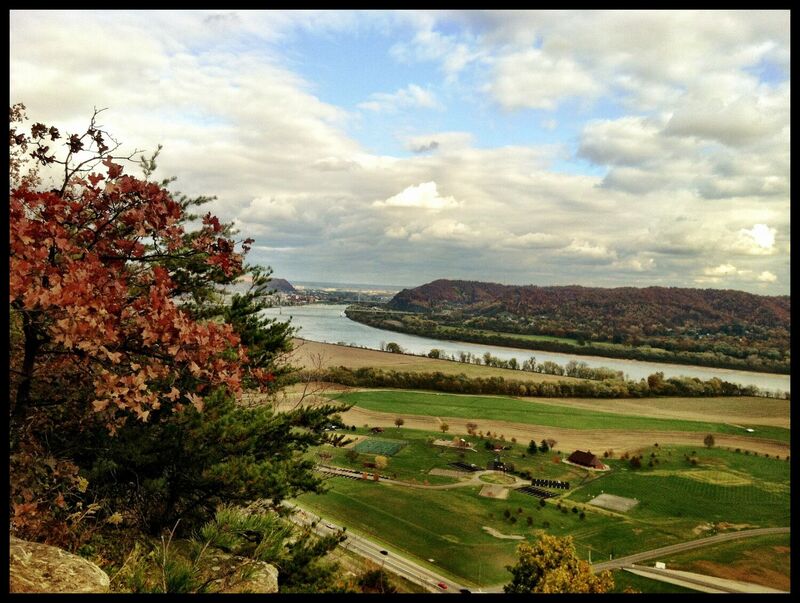 View of Riverside Park and the Allan Eckert Trail from Raven Rock, Scioto County, Ohio (Fall 2012). : Image courtesy of Andrew Lee Feight, Ph.D., from the Scioto Historical Series, private collection, Friendship, Ohio. Andrew Feight, Ph.D., “Allan Eckert & Tecumseh at the Mouth of the Scioto,” Scioto Historical, accessed April 24, 2019, https://sciotohistorical.org/items/show/8.